Since it fits the mid-'60s period and storyline so well, it may have been written especially for the show. Or maybe it's an oldie that I don't remember. DEAR KAREN: Neither is the case. By Skeeter Davis, “Ladder of Success” is an LP cut only. By not being issued as a single it is extremely unlikely you would have heard it in the '60s. “Ladder of Success” is on Skeeter's “Let Me Get Close to You” (RCA Victor 2980) album, released in October 1964. DEAR JERRY: I have two very different copies of “Matchbox,” both backed with “Slow Down,” by the Beatles. One of them seems to be the result of either printing or production errors. On the oddball copy, none of that information appears anywhere. They failed to print all of the text on the right side. They also made another omission. It involves only one letter, but the result is hilarious. Instead of crediting “The Beatles,” the variant label shows the artist as THE BEATLE, as if it were just one of the four. There are no mistakes or differences on the “Slow Down” side. How do such discrepancies affect value? DEAR ARCHIE: In this case, less is more. The rare copy with all the “Matchbox” text on the right side missing, and the laughable “Beatle” credit line, is valued at $400 to $500, more than double the standard, error-free issue. Worth noting is that “Matchbox,” a Carl Perkins original, is pretty much a solo vocal by Ringo Starr. Thus the singular “Beatle” credit is more appropriate here than for most of their other recordings. IZ ZAT SO? Though it can't top the screwy “Beatle” acknowledgment on “Matchbox,” there is another recently discovered Beatles-related misprint. At least one copy exists of “Helen Wheels,” by Paul McCartney & Wings (Apple 1869), where the A-side (exterior of the apple) is missing nearly all of the intended text. Except for "Mfd. by Apple Records, Inc." in tiny print at the very bottom, there is no text whatsoever on this 1973 original. As with “Slow Down,” the flip side of “Matchbox,” this B-side, “Country Dreamer” (sliced apple), is also a properly printed label. The current value of the funky, unprinted version of “Helen Wheels” is $350, about 35 times as much as ones without Helen's missing text. 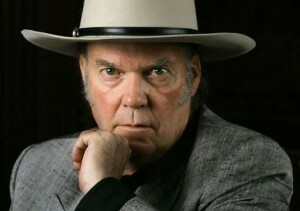 always loved Neil Young's music, he knows great sound when he hears it! Legendary rocker Neil Young hit out yesterday at the poor quality of music audio. You got better listening in 1978 than you do today, he said. The sound quality of today’s digital music files was so low that it undermined the artistic intent of musicians like himself, he declared. Young was giving an onstage interview at The Wall Street Journal’s D: Dive Into Media conference in California. And he said even Apple's Steve Jobs was on his side. Jobs was such a music fan that he didn't use his iPod and its digitally compressed files at home, said Young. Instead he listened to vinyl albums. Don Cornelius, creator of the TV dance show "Soul Train," is dead at 75 of a self-inflicted gunshot wound, according to the Los Angeles police department. Cornelius' death was discovered early Wednesday morning at his Sherman Oaks, Calif. home. 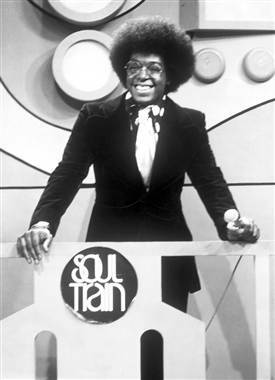 "Soul Train" began in 1970 in Chicago and aired in syndication from 1971 to March 2006. It was one of the first shows to show case African-Americans prominently, although the dance group was racially mixed. Cornelius was the first host and executive producer. The show began each episode by welcoming viewers to "the hippest trip in America" and closed by wishing them "love, peace and soul." Minuscule Detroit based record label Five Three Dial Tone is set to kick off a short run vinyl series of split 7" records featuring covers of some of their most favoritest bands entitled 'Disarm The Settlers.' The inaugural release will pay tribute to Dayton Ohio's Guided By Voices, pressed onto the finest green wax that money will buy, and featuring two fantastic Detroit bands who we are ecstatic to have agreed to such a silly project. 1. Ryan Allen & His Extra Arms tackle "I Am A Scientist" and "Motor Away." Led by Mr. Ryan Allen himself, formerly of Thunderbirds Are Now!, Friendly Foes, & Red Shirt Brigade, these versions of the classics still get a throwback nod. Joined on Motor Away by Arun Bali (guitarist of Saves The Day), Ryan breaks out the synth and goes a little more '97 than '95. 2. The Kickstand Band are adorable. They take "Non-Absorbing" and "Game Of Pricks" and ratchet up the cuteness. Boy/Girl vocals, young innocence, the whole nine-yards really. Allison (bass/vocals) of The Kickstand Band toured with The Von Bondies for a minute, while Gordon (guitar/vocals) was also a member of The Sights who were signed to James Iha's Scratchie imprint. None of that really applies to anything here but it gives me a lot of stuff to put into bold. The 7" was released with 50 special editions featuring hand collaged center labels and alternate artwork. 25 were available in Dayton Ohio, and the other 25 were available at a Detroit area release party. All of the special editions sold out and everyone lived happily ever after. The remaining vinyl is available for purchase. The five platter vinyl set is called 'June 2009' and will feature early Toro Y Moi recordings. The vinyl release is scheduled for April 23rd via Carpark Records. 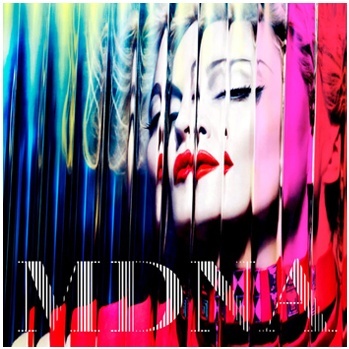 The great one has just released the cover art for her upcoming album 'MDNA,' which is set for release on March 26th. 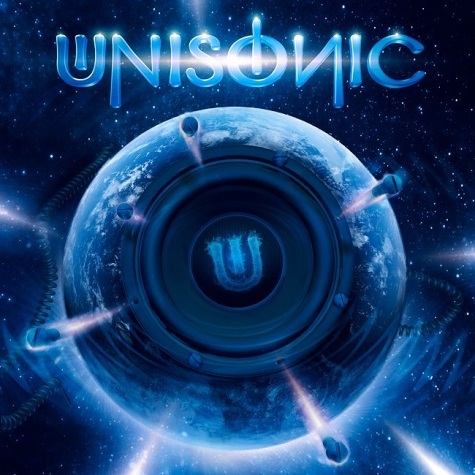 The cover artwork was created by graphic artist Martin Häusler. LONDON, Feb. 1, 2012 /PRNewswire/ -- Following the recent announcement of a 19-date tour to commemorate the 40th anniversary of 'Thick As A Brick,' on April 2nd (April 3rd in North America) Ian Anderson will release a sequel to the original album. In 1972, Ian Anderson wrote and recorded the Jethro Tull Progressive Rock classic album 'Thick As A Brick.' The lyrics were credited at the time to the fictitious child character, Gerald Bostock, whose parents supposedly lied about his age. The record instantly became a number one Billboard Chart album and enjoyed considerable success in many countries of the world. So, forty years on, what would Gerald Bostock – aged fifty in 2012 – be doing today? What might have befallen him? The anniversary "part two" album will examine the possible different paths that the precocious young schoolboy, Gerald Bostock, might have taken later in life through alter-ego characters with song-section identities illustrating the hugely varied potential twists and turns of fate and opportunity. Not just for Gerald but to echo how our own lives develop, change direction and ultimately conclude through chance encounters and interventions, however tiny and insignificant they might seem at the time. Ian Anderson says of the album, "As we baby-boomers look back on our own lives, we must often feel an occasional 'what-if' moment. Might we, like Gerald, have become instead preacher, soldier, down-and-out, shopkeeper or finance tycoon?" Adding, "And those of more tender years - the social media and internet generation - may choose to ponder well the myriad of chance possibilities ahead of them at every turn ....."
To coincide with this groundbreaking release, for the first time since 1972, Anderson and fellow musicians John O'Hara (keyboards), David Goodier (bass), Florian Opahle (guitar) and Scott Hammond (drums) - as well as some guest performers - will take to the road to perform the album in its entirety and, it can now exclusively be revealed that, in addition, there will be a second part to the show where Anderson and the band will also perform the sequel. 'Thick As A Brick 2' will be released as a standard jewel case CD and digital download, and in a Special Edition 2-disc package with DVD featuring 5.1 stereo mixes, 24-bit stereo mix, video of the making of the album, interviews with the musicians and Ian Anderson reading the lyrics in various locations. NEW YORK, Feb. 1, 2012 /PRNewswire/ -- Legacy Recordings, the catalog division of Sony Music Entertainment, has entered into a historic new record deal with American legend and innovator Willie Nelson. The deal marks a label homecoming for Nelson, who, from 1975-1993, cut a phenomenal string of top-selling singles and albums for Columbia Records, beginning with 1975's seminal smash Red Headed Stranger. Under the new agreement, fans can look forward to five brand-new Willie Nelson albums, with the first slated for release in spring 2012. "We couldn't be more excited to have the opportunity to work with Willie on this landmark partnership," said Adam Block, Executive Vice President and General Manager, Legacy Recordings. "There's a natural and organic relationship between new recording projects and catalog activity that promises to ensure the lasting importance of Willie and his music." With a six-decade career and a catalog of more than 200 albums to his credit, the iconic Texas singer-songwriter Willie Nelson has earned a permanent position in pop music's pantheon with songs that combine the sophistication of Tin Pan Alley with the rough-and-tumble grit and emotional honesty of country music. He brought pop and country together on the radio in the early 1960s with unforgettable songs like "Crazy" (Patsy Cline), "Hello Walls" (Faron Young), "Funny How Time Slips Away" (Billy Walker), "Night Life" (Ray Price) and others and, by the mid-1970s, had become a superstar in his own right as a prime mover of a revolutionary and thriving outlaw country music scene. The Red Headed Stranger, Willie's first album for Columbia Records in 1975, catapulted the artist to the front ranks of popularity, making his a familiar name in country and city households across America and around-the-world. 5. Mazzy Star - Common Burn 7"
10. Guided By Voices - Chocolate Boy 7"
In 1954, backed by his Jazz ensemble, Big Joe Turner records the original version of "Shake, Rattle and Roll". The tune will top the Billboard R&B chart next June, but did not cross over to the Pop chart. Some of the original lyrics, that would have been considered highly sexual at the time, were changed when Bill Haley recorded the song five months later. In 1957, 20-year-old Don Everly and his 2-year-younger brother Phil sign a recording contract with Cadence Records. During their career, The Everly Brothers will have 35 Billboard Hot 100 singles. In 1958, in West Hollywood, Elvis Presley recorded "Doncha' Think It's Time" and "Wear My Ring Around Your Neck." In 1963, 17-year-old Neil Young performed his first professional date at a country club in Winnipeg. In 1964, Beatlemania comes to America when "I Want To Hold Your Hand" becomes the first of twenty Billboard number one hits for Fab Four. It would stay on top for seven weeks, with world wide sales of fifteen million copies. Also in 1964, Matthew Walsh, the Governor of Indiana declares the song "Louie Louie" by the Kingsmen ( which was currently #6 on the Hot 100) to be pornographic. He asks the Indiana Broadcasters Association to ban the record, although stations claim it's impossible to accurately figure out the lyrics from "the unintelligible rendition as performed by the Kingsmen." Although much has been written about the controversy, Indiana was the only state to actually ban the record from radio play. In 1965, at the Arthur Smith Studios in Charlotte, North Carolina, James Brown records "Papa's Got A Brand New Bag", which will reach #8 on the Billboard Pop chart and #1 on the R&B chart the following August and later win a Grammy Award for Best Rhythm and Blues Recording. In 1966, in New York, the Young Rascals recorded "Good Lovin.'" In 1967, at EMI's Abbey Road Studios in London, the Beatles began recording the title song for their album, "Sgt. Pepper's Lonely Hearts Club Band." After three more sessions, the track was completed on March 6. The reprise of the song that appears near the end of the album was recorded on April 1, 1967. In 1968, the Who started their third U.S. tour in San Jose, CA. In 1968, the Doors announced that Universal International had offered the group $500,000 to star in a feature film. An ABC-TV special, a group "humor book," and a book of poetry by Jim Morrison were also announced as being in the planning stages. Only the poetry book became reality. In 1972, Chuck Berry had his first UK #1 single with a live recording of a song he’d been playing live for more than 20 years: “My Ding-a-Ling.” U.K. public morality campaigner Mary Whitehouse attempted to have the song banned due to its innuendo-laden lyrics. In 1975, Elvis Presley arranges for daughter Lisa Marie to meet her favorite singer, Elton John, for her seventh birthday. In 1979, Blondie's "Heart Of Glass" is certified Platinum in the UK, where it tops the Pop chart. The song will also rise to number one in the US the following April. In 1985, the Eagles' Glenn Frey makes his acting debut on an episode of US TV's Miami Vice that was based on his song, "Smuggler's Blues." In 1987, after the United Nations and the African National Congress removed him from their blacklist, Paul Simon kicks off his "Graceland" tour in Rotterdam. 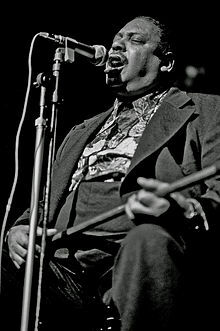 He had been banned after he broke the cultural boycott on recording in South Africa. In 1988, the Cars, who had placed 15 songs on the Hot 100 between 1978 and 1987, announce their break up. In 1989, singer Paul Robi, a member of the Platters (1954-1965), died of cancer at the age of 57. In 1992, Elton John and George Michael teamed up to score a US number one with a song recorded live at Wembley Stadium the previous March, "Don't Let The Sun Go Down On Me". Elton had originally released the song on his "Caribou" album in 1974. In 2004, Justin Timberlake caused a huge uproar when he tugged at Janet Jackson's outfit and revealed her left breast live on US TV during the half-time show of Superbowl XXXVIII (38). Four days later, that scene would become the most searched for image in the history of the internet. In 2007, Mike Clark, owner / manager of Atlanta's Southern Tracks Recording Studio, died after an 8 month illness. He was 63. For many years he played drums with such popular 1960's artists as Tommy Roe, Billy Joe Royal, Joe South, Ray Stevens and Roy Orbison and was inducted into the Georgia Music Hall of Fame in 1999. In 2008, Paul McCartney said recent media reports that he had heart surgery last year are "entirely untrue". The 65-year-old former Beatle says that during a routine medical examination over a year ago, "there was a minor irregularity which I needed to have tests for and which I have now been assured is completely fine." In 2010, more than 80 artists gathered to record a remake of "We Are The World." The next day Janet Jackson laid down her version of Michael Jackson's part. The song was premiered at the opening of the Winter Olympics on February 12.